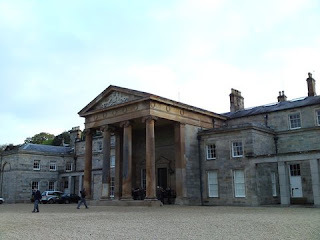 I have spent a rather agreeable afternoon at Mount Stewart House and Gardens, County Down. It was fine, sunny and mild. There were several events today, including a classic car rally and a free jazz concert at the croquet lawn. I took a tour of the House, noticing a hard-back copy of the Hon Alan Clark's Diaries on an occasional table in the drawing-room (much to my delight). I ambled in to the shop. Alas, despite a fair selection of Christmas cards, there are still no traditional National Trust ones. Some silly chump has taken it upon themselves to stop the production of NT cards with pictures of their wonderful properties and country houses, it would appear. Fancy a compact Thermos food flask? This is the place; and it can be yours for £25. I paid homage to the late Lady Mairi's grave at the Londonderry burial ground above the Lake. I met my aunt and Pat for coffee ths morning at Whalley's Café, High Street, Holywood, County Down. The disadvantage for motorists is that parking wardens proliferate the town; and on-street parking is restricted to a maximum of one hour, including Saturdays. I only just managed to find an available space without restrictions on Church Road. The Whalley Café is located near the may-pole. It has about half a dozen tables. I believe they also have an art gallery. 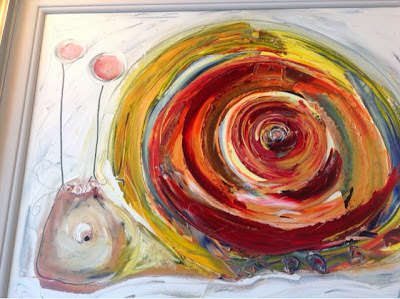 Above is a contemporary, though colourful, oil-painting by an artist whose name eludes me, for sale at £995 if I recall correctly. I ordered a mocha coffee and cherry scone with butter, jam and thick cream. One advantage of Whalley's is that it is a lot quieter than the coffee-house we usually frequent in the town. Although my hearing is satisfactory, one of the others has a little difficulty with background noise. The bill came to just under £13. Afterwards I admired the counter display at Corrie's farm shop, also close to the may-pole. 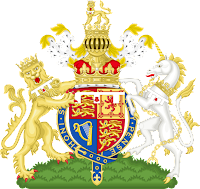 Released today are the conjugal Arms of The Duke and Duchess of Cambridge, which were approved in February this year by Her Majesty The Queen. 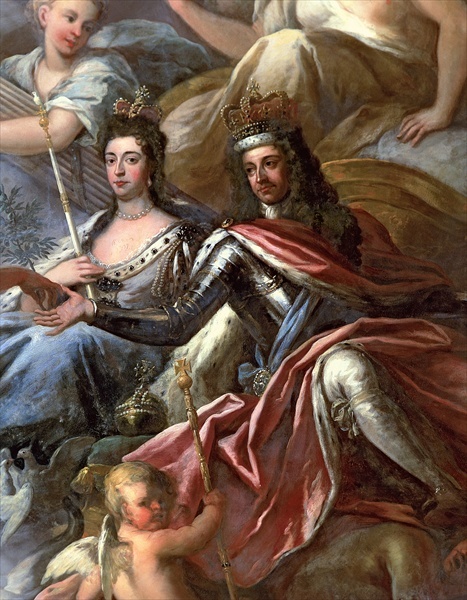 Conjugal Arms are those that show the separate shields of a husband and wife, side by side. In this case, the two Shields are His Royal Highness's on the left and Her Royal Highness's on the right, with both supported by the Duke of Cambridge's Supporters of the Royal Lion and Unicorn. Gibb's Island, near Killyleagh, County Down, was the venue today for the National Trust's Strangford Lough task force. There were ten of us today. We undertook a number of jobs, including barrier fencing, a little stone-walling and path maintenance. This little island - practically a peninsula - is picturesque and a haven for wild flora and fauna. Quoile yacht club is located adjacent to Gibb's. There are still quite a few yachts on their moorings, including a handsome vessel called Glance which, I am told, was built in the 1920s. I cycled into town today in order to meet up with a friend whom I hadn't seen for about a month. 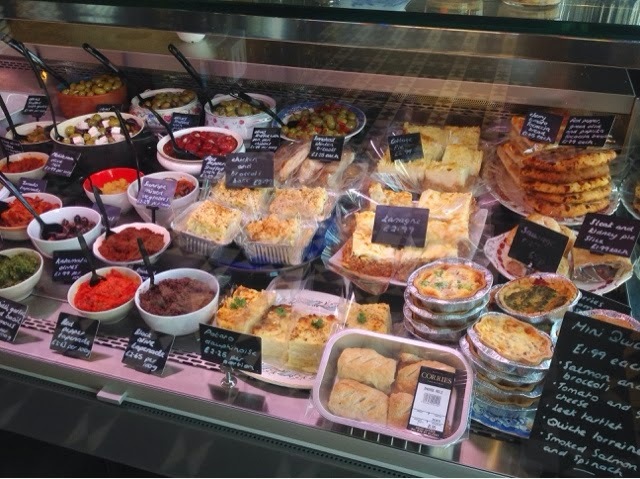 We met at a city centre bar and the "creamy haddock fillet set on fluffy champ and topped with a creamy bacon and spring onion cream" caught the beady eye instanter. A judicious decision was made, because it was superb, especially given the price - £8. I was quite conetent to drink a Sprite lemonade with ice and lemon. Earlier, I ventured in to Marks & Spencer's store, where I had a look at the lamb joints. 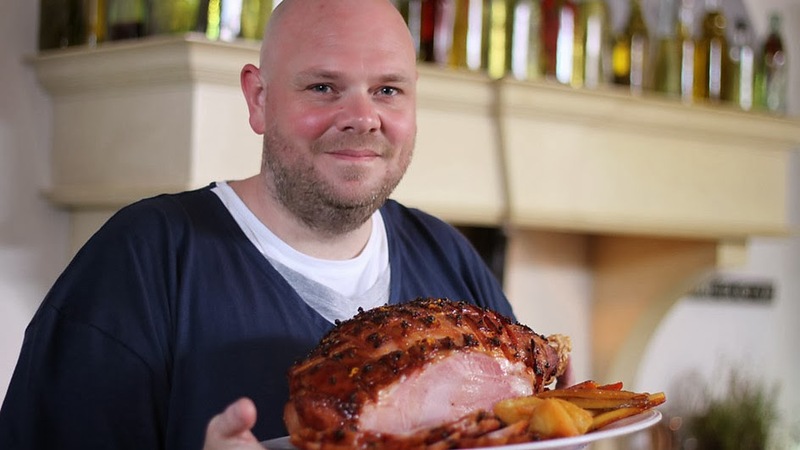 It's all Tom Kerridge's fault! I watched a new series on BBC Two HD last night, viz. Tom Kerridge's Proper Pub Food. Generally I stopped viewing cookery programmes several years ago. I simply got bored of them, though I do watch Hairy Biker "repeats" occasionally. 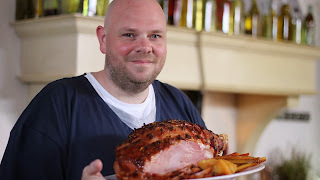 However, I'm glad I recorded Tom Kerridge's show. This large chef (a good sign!) 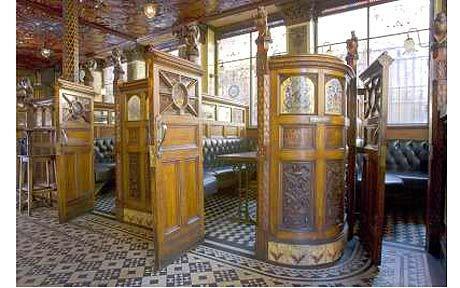 is truly inspirational and this is reflected in the fact that his pub ~ The Hand and Flowers ~ has two Michelin stars. I drooled when I watched him preparing the slow roasted lamb shoulder with thinly-sliced potatoes and onion. He cooked it in the oven at a mere 130c for five or six hours and the lamb literally fell off the bone. Preheat the oven to 130C/275F/Gas 1. In a bowl combine the onions, potatoes and thyme. Season with salt and pepper. Layer the potatoes and onions in a roasting tin and place the lamb on top skin-side up. Cut small incisions in the lamb using a small knife and stick the whole garlic cloves in the holes, pushing them into the meat to prevent them burning while the meat cooks. Pour the chicken stock over and place in the oven for 4-5 hours, or until the potatoes are crisp on top and soft inside. When cooked, remove the lamb from the oven, cover with aluminium foil and set aside to rest for 20 minutes. Serve with French beans (or any green vegetable of your choice). By the Grace of God, King of England, Scotland, France and Ireland, Defender of the Faith, etc. The car park was practically full today at Minnowburn, a beautiful woodland merely a few miles from Belfast city centre. The National Trust has done a magnificent job here. I went for a stroll, to the pond and up the hill to the Rose Garden. There is a fine prospect of Malone House in the distance across the valley from here. A new walk is being created beside the car park, which seems to lead towards the River Lagan. I had coffee and a muffin this morning at a café in Holywood, County Down, with my aunt and a friend. I managed to squeeze in to a parking space in the vicinity. My muffin consisted of blueberries and some sort of unctuous creamy concoction, which was rather yummy. We got up to date with a good chin-wag, my aunt having spent awhile at Majorca, Puerto Pollensa to be precise. THIS afternoon, having "rowed" for forty-three minutes on a machine, burning 400 calories in the process, I paid a visit to Marks & Spencer's food emporium at Ballyhackamore, Belfast, where I procured a little box of Belgian choccies, chunky cod in batter, sweets and something else, which description eludes the Belmont grey cells. I have been singing merrily to Billy Joel's Allentown, which must surely be a ditty of great pre-eminience of the eighties; or is it seventies? THE QUEEN has been pleased to appoint Dr Angela Garvey as Her Majesty’s Lord-Lieutenant for the County Borough of Londonderry. Dr Garvey succeeds Sir Donal Keegan KCVO OBE when he retires on the 8th October, 2013. Dr Angela Garvey was born in 1953. She is a consultant in palliative care medicine at Algnagelvin Hospital and a fellow of the Royal College of Physicians in Edinburgh and London. She retired from her consultant’s post in May, 2013. Dr Garvey is a member of the Association of Palliative Care Medicine GB and Ireland and a member of the Irish Association for Palliative Care and the European Association for Palliative Care. She has established close working relationships with Foyle Hospice, fostering integration of voluntary and statutory specialist palliative care services, and has been involved with local community groups in a project to raise awareness of palliative and end of life care issues. Dr Garvey was appointed a deputy lieutenant in November, 2004. The Church of Ireland, part of the Anglican communion, has appointed its first female bishop. The Rev Patricia (Pat) Storey, rector of St Augustine's Church in Londonderry, is to be the Most Rev the Lord Bishop of Meath and Kildare. The diocese of Meath is traditionally the premier bishopric in the Church of Ireland and the bishop is styled Most Reverend. 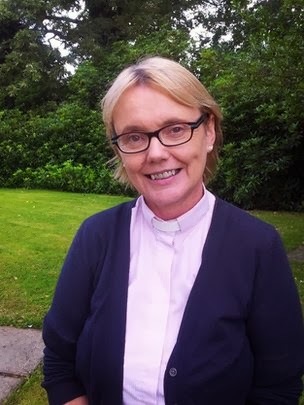 The House of Bishops meeting yesterday in Dublin appointed the Revd Pat (Patricia) Storey to succeed The Most Rev Dr Richard Clarke, who is now Lord Archbishop of Armagh, Primate of All Ireland and Metropolitan. The Rev Pat (53) has been Rector of St Augustine’s, Londonderry (Derry and Raphoe) since 2004. She is married to the Rev Earl Storey and has two adult children, Carolyn and Luke, and a son-in-law Peter. Having grown up in Belfast and studied French and English at Trinity College, Dublin, she trained at the Church of Ireland Theological College (now Institute) and was ordained deacon in 1997 and priest in 1998. She served a curacy in Ballymena (Connor) and was a team vicar in Glenavy (Connor) and a part-time youth worker co-ordinator with the Church of Ireland Youth Department. Among Central Church participation, she is a member of the Standing Committee of the General Synod. Mrs Storey becomes the first woman to be appointed a bishop in the Church of Ireland. The consecration of the new bishop will take place in due course, followed by enthronement in the diocesan cathedrals thereafter. My attention has been drawn to a planning application for 275 Belmont Road, Belfast, formerly Pirrie House and its gardens. This site is located at the corner of Pirrie Road. A century ago it formed the grounds of Ormiston House; indeed Ormiston's former Belmont gate lodge is still at the entrance to Pirrie Road. For whatever reason, Pirrie House and its gardens were swept away a year or two ago, leaving an eye-sore on the road. This is entirely a residential area. The nearest retailers are located at Strandtown, which is at the beginning of Belmont Road. The planning application seeks full permission to develop a neighbourhood shop and petrol filling facilities at 275 Belmont Road. There would be twelve pumps' forecourt canopy; cash machine; car-park with 21 spaces. The applicant intends to operate from 6am until 11pm, seven days a week, employing fifty full and part time staff. I pass this location frequently during the week. In fact I drove past tonight, en route to the Sports Club for a swim, and took the photographs. Two schools are within the vicinity. Belmont Road, leading to the Hawthornden roundabout, can be particularly busy at peak times. I feel that any retail unit at this residential site is most inappropriate. I am convinced that local residents do not want a retail development at 275 Belmont Road. Traffic levels are high enough and such a development would only increase congestion. Schools are within walking distance and this could be hazardous or possibly dangerous for school-children, who would inevitably be tempted to visit the retailer for snacks or sweets. The residential nature of this area must not be compromised by a petrol station and convenience store. I intend to object to this application in writing to the planning authorities. The deadline I was given for objections to be received by the Planning Office is the 27th of September. The planning reference number, Z/2013/0944/F, also has to be quoted. I've spent the day at Ballyquintin Farm, at the southern-most tip of the Ards Peninsula in County Down. We were preparing and undercoating several large barn doors in the outbuildings of the farm. Today there were six of us. Charcoal Grey was the undercoat and pillar-box red will be the final coat. It was sunny, dry and breezy today. I ventured into town today. I don't usually go into town of a Saturday, though it is Euro Heritage weekend and I wished to see a few places. I went in the trusty two-wheeler and dismounted firstly at Joseph Braddell & Son, North Street, where I bought a good pair of hunting socks. The intention is to wear them with the wellington boots, because they are very long and ought to stay up! I wear wellies quite often when I'm volunteering with The National Trust. Good value at a tenner. My next stop was the First Presbyterian Church, Rosemary Street, one of the most elegant ecclesiastical edifices in Belfast. It was built in 1783. There is a memorial to John Holmes Houston, of Orangefield, County Down. My final visit was to Freemasons' Hall at Arthur Square, at Cornmarket. Here there is a portrait of one Thomas Valentine JP, of The Moat, Strandtown, Belfast. I have spent a terrific afternoon in the company of old friends from Harrow. We met at Belfast's celebrated Crown Bar in Great Victoria Street, a property of the National Trust, though splendidly run by Nicholson's Pubs. I had a few Tanquerays; the others supped pear cider. For lunch, John and self enjoyed a fine plate of cod and chips with mushy peas and tartare sauce. My pudding was apple crumble with custard. Everything was very good indeed, as was the service. We were fortunate enough to have a snug to ourselves. We stayed at the bar until ten past three, when the others had a train to catch. THE BEER GARDEN at the rear of the National Grand Café, High Street, Belfast, is almost ready. It will be accessible from Skipper Street. The Countess of Wessex is undertaking a visit to India and Qatar in support of the sight-saving charity ORBIS from the 17th-24th September, 2013. Her Royal Highness will visit the ORBIS Flying Eye Hospital in Kolkata, India where she will witness patients undergoing surgery. Onboard, HRH will meet medical volunteers from around the world who share their skills with local eye care workers to improve eye care in local communities. The Countess of Wessex will travel to a partner hospital, where she will met both pre- and post- operative patients and hear from local trainees. HRH will then attend a medical training symposium where she will make a speech. Her Royal Highness will travel on to Qatar where she will meet members of the local philanthropic community in the country in support of ORBIS’s childhood blindness initiatives in countries such as India and Bangladesh. The Duke of Cambridge is to cease active service in HM armed forces after more than seven years of service, Kensington Palace has announced. Prince William completed his final shift as a Royal Air Force search and rescue pilot on Tuesday, September 10th, 2013. He will now focus on royal duties and charity work, a palace spokesman said. His Royal Highness will continue to support the work of HM The Queen and the Royal Family through a programme of official engagements - both at home and overseas - with The Duchess of Cambridge, the palace added. He will work closely over the next year with The Royal Foundation. Prince William is currently considering a number of options for public service, the palace said, with a further announcement to follow in due course. Tuesday's final RAF shift brought to an end a three-year posting on Anglesey for HRH. "I know that I speak for Catherine when I say that I have never in my life known somewhere as beautiful and as welcoming as Anglesey. I know that both of us will miss it terribly when my search and rescue tour of duty comes to an end next month and we have to move elsewhere. From the bottom of my heart, thank you for making my wife and me so welcome when we arrived here, as you do thousands of visitors each year." This is the first chance I've had to write since seven-thirty this morning. I left Belmont GHQ quite early for a rendez-vous with the NT volunteers at Killyleagh, County Down. We have spent the day on Island Taggart, my first visit to the isle since April. Island Taggart is a property inalienably held by the National Trust. It lies between Ringdufferin directly to its north and Killyleagh, the nearest village, to the south. The island is one mile long and a quarter of a mile wide at its widest point; a total area of about 85 acres, acquired in 1984 from Patrick and Kathleen Mackie. Our first task was to trim the overgrown grass in the small orchard, where native varieties of apple and pear trees are growing. We suffered a set-back last year when livestock encroached upon the orchard and gnawed at the little trees. Later we picked Echlin or Echlinville apples from trees in the old orchard, beside the farmhouse. I've written about the Echlins of Ardquin here. After lunch in the derelict farmhouse we went for a stroll round the island to inspect the ponds. The final task of the day was to commence foundations for the installation of an old traditional gate. This necessitated excavating a two or two-and-a-half foot hole for the wooden gate-post, which will need to be about eight feet in length. The gate must be five and a half feet high itself. To our amusement we noticed that there had been a makeshift camp-site at this spot: Grass had been cut; camp-fires established; and even a port-a-loo complete with wooden seat. 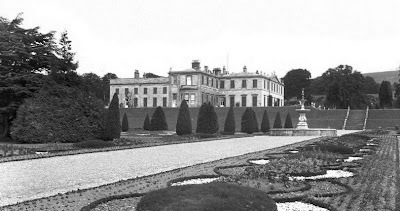 The Duke and Duchess of Abercorn live at their ancestral seat, Baronscourt, in County Tyrone. The Duchess of Abercorn OBE is sister of the Duchess of Westminster and sister-in-law of the 6th Duke of Westminster KG CB OBE TD DL). The Baronscourt estate extends to about 15,000 acres. His Grace was a lieutenant in the Grenadier Guards and later served as Ulster Unionist MP ~ known as James Hamilton MP ~ for Fermanagh & South Tyrone from 1964-70. He was Lord Steward of the Household, 2001-09, and Lord-Lieutenant for County Tyrone, 1986-2009. 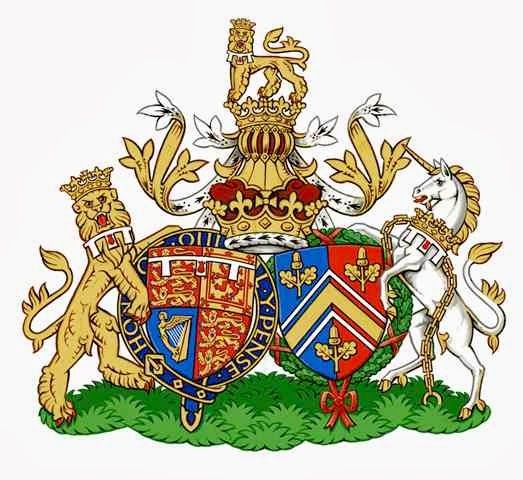 The Duke is a Knight Companion of the Most Noble Order of the Garter (KG); indeed the banners of the Dukes of Abercorn and Westminster are displayed at their Garter Stalls in St George's Chapel, Windsor. In 1996, the Duke's town residence was 10 Little Chester Street, London. The family had a holiday home, Hamilton House, on Windermere Island in the Bahamas. His Grace acquired the Belle Isle Estate, County Fermanagh, in 1991 for his younger son, Lord Nicholas Hamilton. The Duke and Duchess have three children: James, Marquess of Hamilton, who is heir to the Dukedom and married to Tanya, Marchioness of Hamilton; Lady Sophia Hamilton; and Lord Nicholas Hamilton (now married himself). Lord and Lady Hamilton have two children: James, Viscount Strabane; and Lord Claud Hamilton. 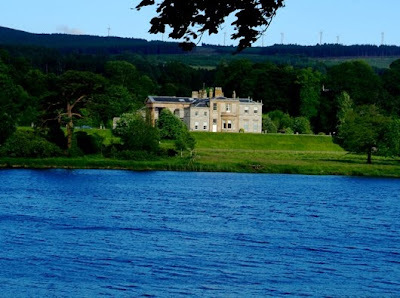 Lord and Lady Nicholas Hamilton live at Belle Isle Castle in County Fermanagh. The dining-table in the Small Dining-Room is set for dinner this evening. My guest is Godmother. It must be six months since we both attached nose-bags. On the menu at Belmont GHQ tonight is Beef Wellington, with spinach and potato gratin and a medley of vegetables. Pudding will consist of orange and passion-fruit tartlets with thick Jersey cream. I thought we might watch a film afterwards, though they last about two hours. I wonder if Godmother has seen Remains Of The Day; or A Handful Of Dust; or even Gosford Park. I'd dearly wish to acquire The Day Of The Jackal for my iPad. King and Queen of England, Scotland, France and Ireland, Defenders of the Faith etc. The Earl of Wessex has spent the day in Northern Ireland. His Royal Highness spent the morning at the Belfast Harbour Commissioners' office, where he presented young people with their Duke of Edinburgh awards. Prince Edward met fifty gold award recipients from across the Province. Dame Mary Peters, DBE, Lord-Lieutenant of the County Borough of Belfast, welcomed HRH, along with the Deputy Lord Mayor, Alderman Christopher Stalford. You never know which topic Timothy Belmont might introduce to this blog. 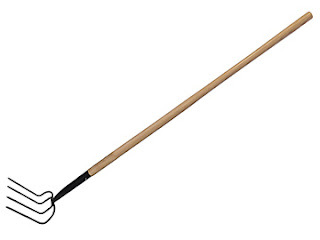 Thanks to a reader, we now know the correct name of the implement in use yesterday at Ballyquintin pond: The Manure Fork. The humble manure fork has found Fame at last. Prior to the introduction of the muck spreader, these tools were often used to pull manure from the back of carts onto the field for spreading at a later date. The National Trust Strangford Lough team has found a new use for it now, viz. dragging blocks of sods from ponds. We have spent the entire day at Ballyquintin Point on the Ards Peninsula, County Down. I was with the National Trust Strangford Lough group. About seven of us were excavating an old pond at the corner of a field. Believe it or not, we found two old hand-saws most effective for this purpose; and a right-angled pond rake. After lunch ~ consisting of cheese & onion sandwiches for self ~ we cleared some undergrowth from saplings in a plantation. Can you spot Timothy Belmont, readers? Of course, I sport the military floppy hat. Today marks the beginning of the new term at the old school, which can only mean one thing for Timothy Belmont: Swimming. We Belmonts are renowned for our aquatic prowess and I'm told my feet ought to have been webbed. Accordingly, I swam sixty lengths of the pool an hour ago, equating to almost a mile, I think.